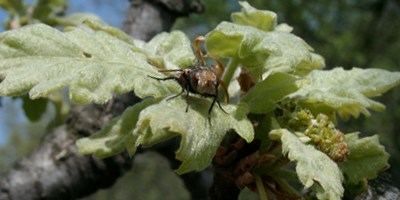 The pubescent oak can be easily recognizable by its greyish, lobbed leaves, which are covered with minute pubescence. Also, it is recognizable by its acorns cups, which are light grey to almost white, with pointed, overlapping scales, covered with tomentum. The trees are small between 4-6 meters with curvy branches. It is typical for these forests that their canopy is not closed but the forest is consisted of mosaics of trees, glades and patches of grasslands. On the Sas-hill this is the original forest and this type of forest is well adapted to the changing, warming climate. The range of the Quercus pubescens scrubs has been greatly reduced. These forests were often sacrificed for the creation of vineyards and orchards, but patches of pubescent oak forest have been remained in undisturbed areas or in steep hillsides areas. On the Sas-hill the density of indigenous shrubs is too high, thus the shrub cover must be suppressed to provide space for the regeneration of the pubescent oaks. In addition, we eliminate the invasive tree species (Acaica, Ailanthus) to plant oaks in the cleared areas.